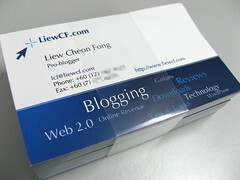 Professional Business cards offer a unique networking opportunity for bloggers. But what if you could get free business cards to distribute among your professional contacts. Ooprint is offering 100 blogger business cards for free to everyone! LiewCF got free business cards from them and they look cool. He says the standard white paper (220g) is free and the back of the business card is printed Ooprint’s URL by default, though you can add $4 to have a blank back.